On March 7, 1982, my mother turned 65 years old. At the time, it seemed such an ancient age, but now that I am securely imbedded in my seventies, sixty-five seems almost young. As I pause this year to remember her and her eventual passing in 2004 at the age of 87, I thought of the letter I had sent her thirty-three years ago. Shirley and I were living in Casper, Wyoming, at the time, and I guess her upcoming birthday that year made me feel a little homesick, so I decided to write her a letter. It was a quiet evening in my sales office in a new home development being built by Pulte Home Corporation. A few days after I sent her the letter, she called to tell me how much she loved it. After her passing, we were going through her personal papers and found my letter I had sent her. I brought it home and put it in my personal file of valued documents...a memento of an expression of love. The following is a transcript of that letter. I guess it’s been a long time since I wrote you a letter, but since it’s not every day that someone reaches her 65th birthday, I thought I would take this special occasion to write. I guess that’s the reason I’m writing this note, Mother, is that, even though I have now been selling long enough that I can talk endlessly with customers about the product I’m selling, I still have a problem telling those people who are closest to me how I really feel about them. Maybe that’s the reason Shirley and I have always done well together because she’s sort of a quiet type, too. Seems we can go for hours sometimes and never say a word but just sort of understand how the other feels. I think that’s the way you and I are. We haven’t really sat down and talked about serious matters very often, but yet I can feel that love and support you’ve given me over the years. It’s hard to believe that I have now lived away from home longer than I lived at home, but it’s true, and yet as long as I live, my days of growing up at home will be treasured memories. I guess that’s why I still enjoy the times we spend at home (Baytown) now, because I can still feel the same love and caring there that I felt when I was growing up. The last few days have been days of remembering for me. Four big events have occurred: your 65th birthday, Bobby’s fifteenth birthday, my fifteenth year since I returned from overseas, and Bobby’s getting his driver’s license. Watching him grow up is like watching an old movie of my own growing up. I’ll never forget last summer when he came back from youth camp. Girls had never seemed to interest him too much, and I sort of jokingly asked him if he had found a girlfriend. His face turned a blood red, and he looked down and said, “Sort of…” Then he told me her name, where she lived, etc. I think in that brief instant I aged ten years, and I suddenly realized that he wouldn’t always be at home with us. I have since put greater value on the times we spend together. It is my fervent prayer that when my children leave home, they will look to their mom and dad as I do to mine. I appreciate, Mom, all you ever did for me and that you were a steady support in every situation. If ever a mom looked out for her kids, it’s been you, and for that I’ll always be grateful. 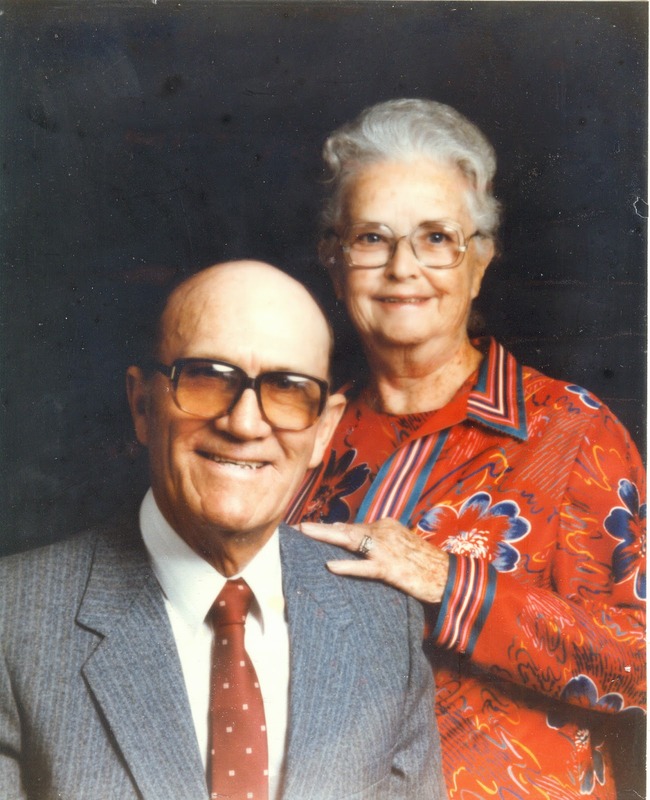 I thank the Lord continually that I was in a home where both parents were in the church and were faithful to the church. Without that spiritual guidance I don’t know where I would be today, but I’m thankful you taught me the value of church and living for God. I’m sitting here in my office writing this letter and learning it’s hard to look like a professional salesman with tears in my eyes, but my mind is spinning with memories of home---206 Hafer, Cedar Bayou-Crosby Road, vacations in Noel, even one of my earliest memories of seeing an overturned truck when you and I went to Oklahoma to see Dad when he was still in the army. Only a few of thousands of memories that make up a childhood. In the twenty years since Shirley and I were married, there have been many goals I have not yet reached. We are not as financially sound as I would like to be, we are too far from my family---even though I love my in-laws, and I still haven’t found a really rewarding job. But I am convinced of one subject...whatever I decide to do tomorrow, you will give me all the support you can. I know I can always depend on you to be on my side no matter what happens…and that has always given me a stability in my life that I value now more than ever. I pray our own home will always be a haven of rest for my kids as your home is for us now. Of course, it’s not just the house I talking about---it’s more of a feeling I get when I’m with you and Dad---a feeling of safety. Maybe this letter is nothing more than a realization for myself that I am not as young as I used to be. I’m having a harder time keeping up with my young son in sports. I am also, as I’m sure every other person who’s gone before me, becoming more aware of the passage of time. To an extent, I think that’s good because the present then becomes more valuable, and one begins to anticipate and appreciate those times spent with loved ones. Anyhow, that’s how I feel about those times we spend with you and Dad. I guess I’d better close for now, Mom. It’s taken me longer than I expected to write this, and I’ve got a class to get ready for tonight. But, I love you, Mom, even though I haven’t said it enough. I know you know it, but I wanted to say it again officially with this letter. You mean more to me than I could ever put into words, and we are all looking forward to Easter when we can be together again.